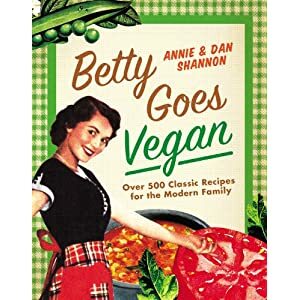 I hope you're not frantically flipping through your Big Red right now looking for the not-vegan version of this recipe... because it isn't in there. This is an adaption of the Peanut Brittle and Starlight Yellow Cake recipes into, well, something quite lovely that goes great with your morning coffee. I made them mini, because that's how I roll*. They are a little sticky, but that's kinda part of their charm. 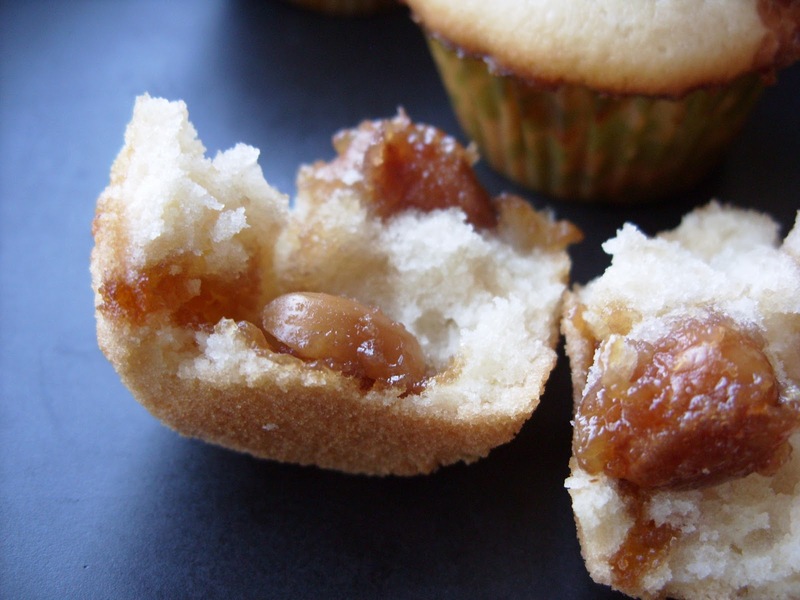 They are perfect breakfast cupcakes! These little guys aren't your mama's cupcakes; they're almost like mini - coffeecakes or monkey bread, and would be great for a brunch potluck or to help make a hard week a little better. They do have a lot of steps, so let's get going so you can have these ready in case this week is already looking a little rocky. 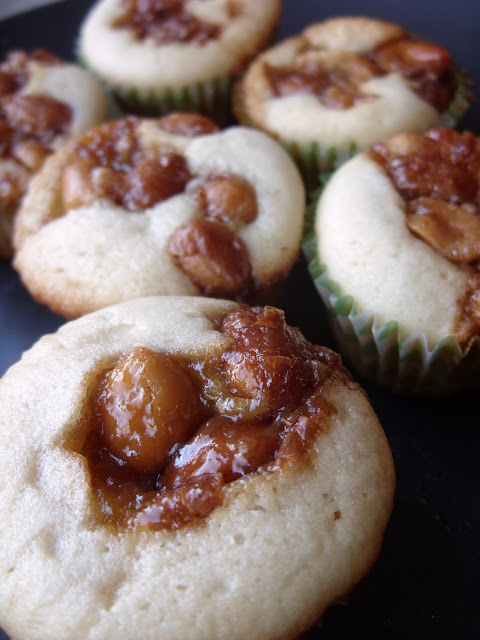 This recipe will make around 2 1/2 dozen mini-cupcakes with some Peanut Brittle filling left over to drizzle over some Soy or Coconut Ice Cream. Yeah, it's that good. Heat oven to 350. Warm your cookie sheet in there for the Peanut Brittle Filling. Once it is warm to the touch, grease the sheet with Margarine. For the Peanut Brittle Filling: In a small bowl, mix Baking Soda, 1 Teaspoon Water, Hazelnut Syrup and Vanilla and set aside. In a saucepan, mix Sugar, 1 Cup Water and the Corn Syrup or Agave Nectar. Cook over medium heat for 25 minutes, stirring occasionally. Stir in Margarine and Peanuts. Cook over medium heat for about 10 minutes, stirring constantly. make sure it doesn't burn, if it starts to before the 10 minutes are up decrease heat to simmer. Quickly stir in Baking Soda Mix. It will get light and foamy and that's good! Pour the Peanut Brittle Filling into the "buttered" cookie sheet and let it cool while you make the cupcake batter. In large bowl, mix all the ingredients with an electric mixer on a low speed for about 3 minutes until it is smooth. If you tilt your bowl a little you can get a nicer creamier batter. Fill your cupcake liners 1/2 way with your batter. Use a small spoon to create a small bowl in the batter. Then put 1 to 1/2 Teaspoons of Peanut Brittle Filling in the center. You'll want to make sure you get a peanuts in there. Try to keep the Filling in the center and keep it from spilling over the sides because it is pretty sticky. Bake for 8-10 minutes until the tops start to turn a nice light sunny cream color. * If how you roll is cakes : You can make this by greasing a 9 inch pan with vegan shortening. Fill the cake pan and then drizzle 1 1/2 Cups of the Peanut Brittle Filling over the central center of the top. Bake for around 20 - 25 minutes - until the top turns a golden brown. These look delicious! I'm thinking I'll have to try them this weeekend. You always amaze me with your recipes. These are off the hook! I am definably trying these! They look amazing! These look delicious! And in a world where cupcakes are all the rage, its refreshing to come across a recipe this unique!